Tony Award winning triple threat Donna McKechnie will always be remembered as Cassie in A Chorus Line, and of course for her solo within it "The Music and the Mirror". 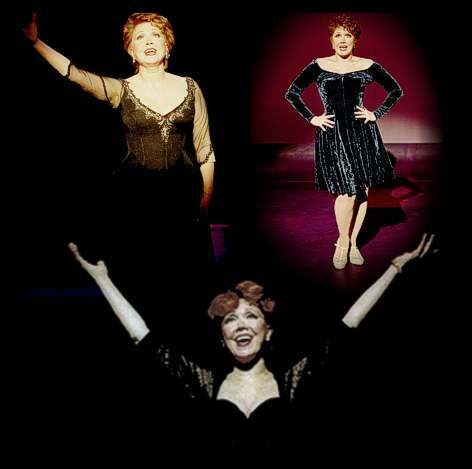 This vet of Broadway, TV and film is currently teaching a musical comedy class at HB Studio in New York and in our chat offers some choice anecdotes from her career. She will appear in Original Cast 3, this year's S.T.A.G.E. (Southland Theatrical Artists Goodwill Event) benefit for APLA (Aids Project Los Angeles) Saturday April 28 at the Saban Theatre. Tell me what you are doing in Original Cast 3. I'm going to do material from A Chorus Line. It's kind of a secret, a surprise, but essentially I'm recreating "Music and the Mirror". That's great! Do you go way back with director David Galligan? OMG, way back, and David was my first champion out there in Los Angeles when I cam out in the early eighties. I did a show early on... I was kind of breaking down some material into cabaret, try-out things and I worked with Tom Rolla at the Gardenia. David did a beautiful story for Dramalogue. He was a great champion and introduced me to a lot of wonderful people. I became a part of that community and of course when he started producing, especially for APLA, it's really been an effort of love for many years. Whenever you do a show, there are happy reunions of people; it's very familial. 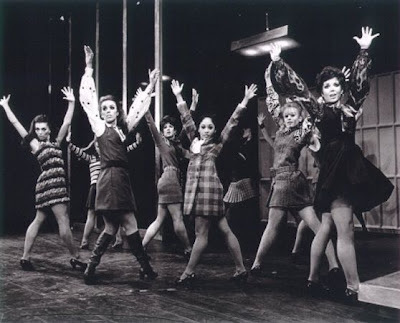 When I was out in LA doing (choreographing) Guys and Dolls (at the Hollywood Bowl in 2009), I was able to cast many of the roles from all the people I've met and worked with, who live there. Let me give you the name of a show or film or TV show you did and tell me an anecdote or some kind of memory that has stayed with you. It was a thrill of a lifetime, really, because, as a little girl, when I first started ballet, The Red Shoes was the movie...we even talked about it in A Chorus Line...the character of Sheila was my inspiration, Moira Shearer. All these years later, I was in the same studio where they filmed The Red Shoes, and I'm working with the same cinematographer and the same makeup artist, who had put makeup on Moira Shearer...It was a private kind of "I can't believe this!" series of events. And of course Stanley Donen (director of The Little Prince) was a great film director to be able to work with the first time out. It was thrilling. It wasn't always fun to make because I was without music and dancing with a black background; it was a challenge, but that's part of it, the magic of movies. You do it in a hole and all of a sudden you're in a beautiful atmosphere in the film. Dark Shadows is one of those unique experiences. I wrote in my book Time Steps (My Musical Comedy Life), a very funny story...those were the days when they would lift the cables and go tape live from set to set. You had to get out of the way with your big hoop skirt. Before I went into Company, I had to leave and on my last day, they left me on the ground underneath all these Styrofoam rocks and peat moss. The lights went out and there I was. That's show business! mckechnie at far right in "turkey lurkey time"
It was record-breaking...first of all, it was a landmark in two ways. This is theatre trivia. 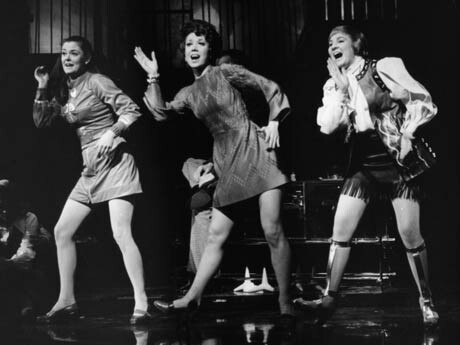 Burt Bacharach hired Phil Ramone a famous producer/engineer for the sound and it was the first covered pit on Broadway. 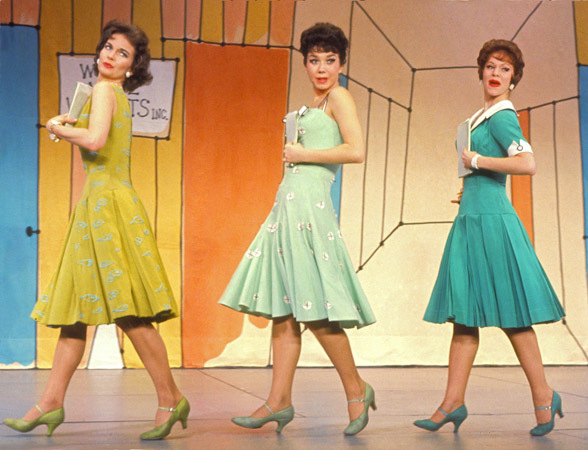 And the first computerized set on Broadway. 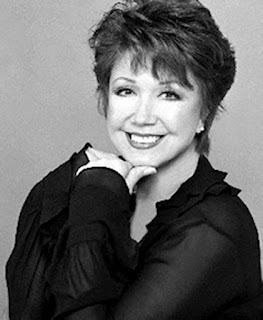 I'm working with Margo Sappington (danced "Turkey Lurkey Time" with her) again; she's putting together a company called American Dance Machine, and I'm training some of the ballet dancers, original Broadway choreography, to be always kept alive and accurate, in an accurate way. That was in some ways my favorite experience because it was my first Broadway show. I was just a kid and looked up to all these incredible people I was really lucky to work with...George Abbot, Abe Burroughs, Cy Feurer and Ernie Martin. Frank Loesser was a beautiful soul. I didn't know how great he was when I met him, but I just adored him. He was a sweet man. Robert Morse was incredible, a great star. Bob Fosse and Gwen Verdon intimidated us all because she walked in and was going to be the dance captain. She was a great star, but she loved that kind of work, as his assistant. It was great...it was Michael Bennett. I had a great success with Michael; he was my other major champion, I guess. He was a great director/choreographer, and we had a challenge to create a dance number for that show. He did a great job. I just loved the set, the company...it was the first really adult cast I had been with, when you think of an adult ensemble. It was really the first adult-themed show about relationships, and even though some did more than others, it was an ensemble piece, a story that was told by all of them. I did that in LA and again at Goodspeed. They keep trying to get it back to Broadway. We had a great company and Jerry (Herman) was with us every step of the way. He was a great mentor also. be able to pass it on. Were you happy with the documentary film Every Little Step? Yes, I thought they did a great job with it. When you think of all the hours they had, and they didn't have a script. They didn't really know their point of view. They kind of put it all together, and I think the filmmakers did a really great job. I think Michael (Bennett) would have loved it, because it has a desired effect that I know he always wanted the film to be, that would create the emotion in the viewer the way that it did in our live audience, in the theatre...that they would really get caught up in the emotion of the story. They captured something real and quite wonderful. It's another valentine to dance, so I loved it. I thought it had some really wonderful aspects. I can't judge it, but I enjoyed doing it...I love Carol (Lawrence) and Lynne Taylor (director). When you're able to work with people again and again, some things are successful, some not, but you keep making the effort. We had a great time. Any time I can come to LA, because I live in New York... when I go to LA, it really is about the people, having reunions and seeing my friends I don't see enough. I don't do that show anymore 'cause that's a theatrical show. I've done another version of it called My Musical Comedy Life, which has the core material but it's a different show. I have some original stuff. I opened it in my first Australian tour two years ago and I continue to do it all over this country. It's so boring because I have the same ones that everybody has. Fred Astaire to me is the perfect dancer with line and taste and style. Anna Pavlova was my first favorite ballerina, and Margot Fonteyn came a close second. Great choices! What else have you been doing besides My Musical Comedy Life? I just did a movie called Thirty Six Saints. It's an independent film and I had a ball making it with these wonderful filmmakers in New York. That'll be out in November. I also did a TV pilot. Who knows what'll happen to that? But I like the activity. And I just got back from Little Women in Naples, Florida. We had a great company. And I have some wonderful concerts coming up. Marvin Hamlisch and I are putting a show together. I would love to do a Broadway show, but I love the concerts, the time when you can go out and work for a couple of days and have the rest of the week off. (she laughs) I'm getting kind of spoiled. What do you tell kids that want to be dancers? Keep dancing, go to class, get a good ballet technique. Those are the basic things, and if you want to be on Broadway, you have to do everything, which includes singing and acting. It's not easy, but it's a total..., that's what theatre is. I teach a course at HB Studio on Bank Street; it's a noble school. I teach what I'm able to for any length of time... my class is called Musical Theatre Performance but it's acting based. I get so much inspiration and satisfaction. I'm inspired by the talent I see; it's tremendous. 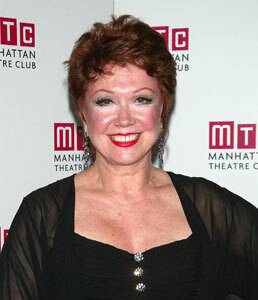 What a talented lady, Miss Donna McKechnie! She is a true inspiration to us all, and we can see her perform in S.T.A.G.E. 's Original Cast 3 on Saturday April 28 at the Saban Theatre in Beverly Hills. Visit their website for ticket information, and remember you are supporting one of the greatest charities APLA and the fight against AIDS when you purchase tickets.